There was a stretch of time when I had stopped using Black Diamond harnesses. While other companies were developing new designs and technologies, BD seemed to be falling behind the curve when it came to innovation in the realm of climbing harnesses. BD won me back to their side when they incorporated the “bullhorn”-shaped waist belt. However there was one notable exception – the original Chaos. I just could not get a good fit and found it to be uncomfortable, hot, and heavy. When the opportunity presented itself to try the new Chaos '09, based on past experience, I almost said no thanks. That would have been a big mistake on my part. BD has developed a new design, Kinetic Core Construction, which sets new standards in function and fit. The 2009 version of the Chaos far surpasses earlier versions of this model and is among the most comfortable harnesses I have ever worn. While working a rescue course recently, I spent a lot of “hang time’ in this harness. My weight was distributed evenly between the waist belt and leg loops and the lower back support was incredible. The large gear loops made racking and gear management a pleasure. After a day of sport climbing, I got halfway home before I realized I still had my harness on – a sure sign of comfort in my mind. There are a couple of things that could use improvement. I did not find the drop seat feature on the rear leg risers to be user friendly and I have some questions about the stiff gear loops getting in the way in off-widths. Despite these minor points, the Chaos is a great harness. Whether used for work or play, this all-around harness is worth checking out. I look forward to seeing BD incorporate the Kinetic Core Construction into their entire line of harnesses. 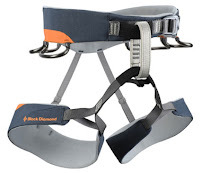 To learn more about the Chaos harness and other great Black Diamond products, please visit BlackDiamond.com. i agree that it's one of the more comfortable harnesses I've ever worn. Thanks so much! I have tried on the Arcteryx and fit a small (31 waist) but need a medium for the leg loops. It sounds like I may have a similar fit issue with the Chaos. I will definitely try one out before buying. REI seems to have the Chaos in stock online so perhaps it will come to the San Diego store sometime soon.